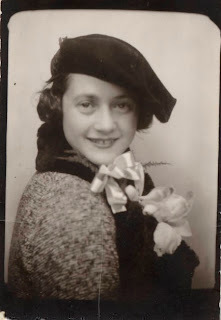 My dad tells me that my grandmother really liked Bette Davis. But despite being able to sing along with parts of "Bette Davis Eyes," I realized I had never seen one of her movies. It was time to fix that! Bette Davis plays Margo Channing, a well-known and respected actress who is starting to wonder if she still feels comfortable playing twenty-somethings as a forty year old. 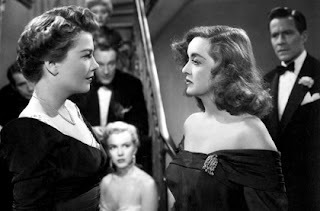 When her friend Karen (Celeste Holm) brings Eve (Anne Baxter), a young fan with an amazingly sad story, into her dressing room to meet her after a performance, Margo decides to take Eve on as a new friend. (Margo, Karen, Karen's playwright husband, and Margo's director boyfriend apparently did not find it creepy that Eve had followed them across the country and had seen every single performance of the play, standing in an alley between performances.) As Eve inserts herself into more and more of Margo's life, meddling with her relationships and using her theater connections, Margo begins to be suspicious of her motives. Margo's friends, however, continue to adore Eve, and Margo becomes more and more isolated from everyone she trusts, as Eve becomes more and more creepy. 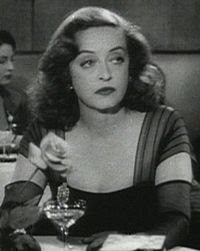 I definitely recommend watching some more Bette Davis movies! I hadn't watched many until recently and they're pretty great. Some are completely insane, but that's part of the fun. Now Voyager is my favorite so far. Kim: I'll have to check out Now Voyager. I read your description of it, and it definitely sounds interesting. You grandmother totally has Bette Davis eyes! I totally give this movie four stars! I'm really glad that you told me it comes out ok in the end because it was bad enough watching everyone be duped by Eve even KNOWING it wasn't going to be all bad. I have to say I loved this movie on so many levels - the friendships and the rivalries work, the minor characters work, the innuendo is so awesome that I clearly won't get it all till I watch it all again at least three times - but I loved the narrator best of all. He's just awesome and in my opinion his "big scene" is the best in the whole movie. I refuse to give any more away because the plot twists are really great. Hair made me want to track down a stylist who can imitate hairstyles of the forties. There's even an aspect of the movie that's just about the theater and the movies that captures a moment when the theater was more prestigious, but the movies were more prosperous - and all the tensions that brought out. However, I also saw it on the big screen with an awesome audience. They clapped when the opening credits began, they laughed and reacted at all the right moments, and then at one key point when a twist is revealed one man cried out "NO!" It was great. I highly recommend this movie, and movie screenings at the LACMA in general.